… also cats & kitties who dig a retro vibe, or just ANYONE who loves high-quality SL footwear: I recommend you pay a visit to Jeepers Creepers, and soon. Eponymous Trenchmouth is celebrating the opening of his new-updated store by giving away these great Strike! 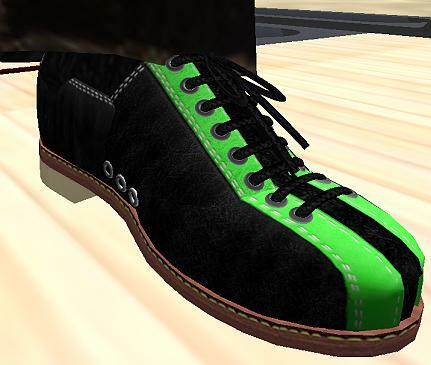 bowling shoes in a special green-and-black color. JC’s usual great quality and attention to detail abound in the leather textures, stitching, sole, tread, eyelets, everywhere! These are resize-scripted to fit human Avatars of any gender or size. They even come with a free pair of socks and a walk animation, just in case you need one of those, too. JC’s quality is among the very best on the grid, and you sure can’t beat the BEST for FREE! While you are there, be sure to check out the jaw-dropping sale prices, too. Most pairs are reduced in price by at least $L50, and many by $L100 or more… and the fatpack pricess – DAY-UM! I spent soooo much money!! I saw many of my favorite styles there selling at fatpack prices which work out to only $L125/pair. The shoes in the transferrable vendor are at the sale prices too! This sale has been going on for a little while now and I have no idea when it ends, so you’d better get there soon! You will fiind these in the box marked “FREE!” on the counter behind the attendant. FK Virtues is a store I first found a while back, I think it was at some charity event (not too sure though). The jeans looked great and when I see great looking jeans, I have to pick them up, that’s all there is to it 🙂 Yesterday I took a trip down to the main store and was Very happy to find that you get three versions of their 23 Jeans in gray if you join the subscribo-matic (subscibo’s are a wonderful invention, no hair tearing about which group to leave). You get the capri version, the skinny version and the classic. The skinny and capri versions come with prim cuffs and all three versions come on the underpants layer as well as the normal. It’s not just for guys either, you girls get the same deal. So that’s six pairs of jeans in one pack, for nothing. Add that to the fact that FK Virtues has a lot of cool, urban clothes for men and women…hmm makes it hard to pass up. 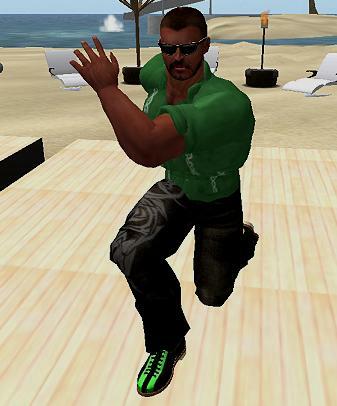 oh oh oh lookie what I found on xstreet for just ONE of your linden dollars hurrrah! Candy Metal has a few dollarbies out on the out-of-world store right now..not sure how long they will be up fer grabs…so hurrry…Click on the pics for a more detailed view! First up Teshan outfit-I got a thing about belts and this one is awesome, comes with the blouse & skirt. Next is Grenei, love the bulky sweater and skirt! ahhh armchair shopping at its finest huh? Go take a look around, mayden couture has HEAPS of prettiness for guys also! I spotted this soooper outfit on free style, its a group gift from Pr!tty-just join the group and check the notices to fetch it up. I just lurrve it..the beautiful bolero jacket will be so useful to wear with other outfits…look at the butterfly on the skirt- awww! 3 diff styles of tights come with it as well as bangles & necklace ! AND also by the desk this dress called “role model” comes with two styles of skirt and 2 styles of shirt! For those that collect poses , like meeee…theres also a pose pack gift yippeeee!! thank you Pr!tty!!! I noticed some gorjusness there at very reasonable prices and a sale on hair in the adjoining room..go check it all out girlies!! A note from the new guy. Hello! I’m Drivin Sideways and I am very proud to announce that I will be contributing here from time to time. Fai, Player, and auststeve have been gracious enough to invite me to the Pure Eggs & Spam team and I’m waaay jazzed! I have a bit of a fetish for shoes so you’ll probably be hearing me rattle on about men’s footwear frequently, although I quite enjoy sharing a good freebie as well. On an unfortunate note: we recently had some trouble with a griefer at my fave-a-roni inworld hangout and it fell upon me to … ummmm … shall we say … “take care of business”. So if you will kindly excuse me I believe that right now is a nice time for a little stroll down by the river. On my shoulder I’m carrying a cool freebie called “Get rid of the evidence” from (0thrive). That is a zero the name and you need the parenthesis as well to locate the place in search. You can find The Evidence and some other cool things in the black bag on the crate. Photos taken in Northfarthing region.